You are a party genius! Such great ideas. Too bad my kids are too old for this. I'll have to remember it long enough to be a super cool grandparent! 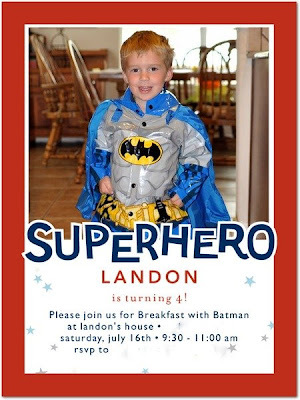 Landon will remember that party for the rest of his life, breakfast with Batman? Coolest mom, EVER. I can't believe he is 4. I started reading your blog before he was 2! Awesome! THE perfect birthday for a superhero visit. The construction paper lasers are my favorite! That is hilarious! I want a batman at my birthday party. But I want mine to be not kid-appropriate. Looks like a fun party! You're brave to do an AM party. I usually do my parties on Sunday so I have all day Satutrday to clean and prepare. E's birthday was on Friday and I did the party on Saturday afternoon, so I had to take off from work on Friday to do the shopping and get ready.